If you are looking for a better way to relax and get clean, most people choose a hot, steamy shower. This is often done by turning up the heat in our bath, but you may be missing out on some of the benefits of a real steam shower. In the past, people would have to go to a sauna if they wanted to sweat it out amid steam, but that wouldn’t help them get cleaner on the outside. Now, you can have the best of both, without ever leaving your home. All you have to do is turn your home bath into a steam shower. Take a look at the top rated enclosures and generators in the table below. Continue reading to learn more about why you should consider investing in a steam shower unit or go ahead and skip to top 5 reviews now. The Ariel reviews all point toward positive, no matter where you look on the internet. It is a compact, 39.4”x35.4” steam enclosure and sauna for your home. It is completely enclosed and offers not only the steam, but an acupuncture massage setting or a rainfall setting. The handheld unit has six massaging jets. It has a stool for you to relax on and an FM radio for you to enjoy. It also looks great with Chroma-therapy lighting and wooden floorboards. Ventilation fan is included. 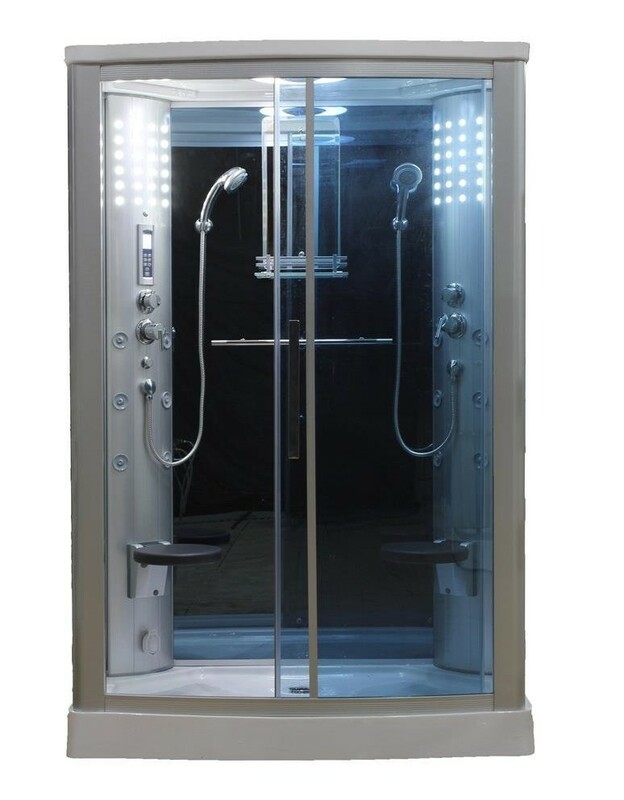 This Eagle Bath Sliding Door Steam Enclosure offers 12 jets of acupuncture massage in a self-contained steam room. The steam sauna operates using a 3 KW generator, which is included, and a standard 110 volts of electricity. It is a rectangle unit that provides you with everything you need. Overall dimensions are 85”tallx55”widex35”deep. 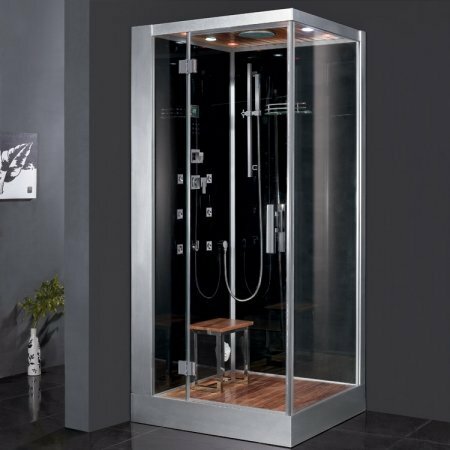 The doors are tempered glass to look stylish, be easy to clean with the self-cleaning steam feature, and last for years. The Nassau has a built in seat for you to relax on. It is designed to fit into the corner of your bathroom. The steam is produced using a 3KW generator and it is fully loaded with everything you need to get the most out of your steam room experience. It quickly produces high temperature steam to improve your circulation and lessen any pain that you may be experiencing, even if your pain stems from arthritis. Additionally, it offers 12 body massaging jets out of a computerized LCD rainfall when used from the ceiling. It also includes a handheld unit. Inside there is also a temperature display, storage shelves that have accent lighting, and a ventilation fan. The Steamist SM-7 Steam Generator is a steam generator that you can choose. It has a rating of 7KW and can produce enough steam for stalls no more than 220 cubic feet. The generator itself is 15x6x15.5 inches. It is 240 volts and produces 29 max amps from a single phase motor. It is ideal for anyone who has an approved stall, but no longer has a generator to produce steam. If you want to save money and still have a steam experience, perhaps you should consider searching a steam generator. You do need a suitable place for the steam so that it does not damage the room it is inside of. 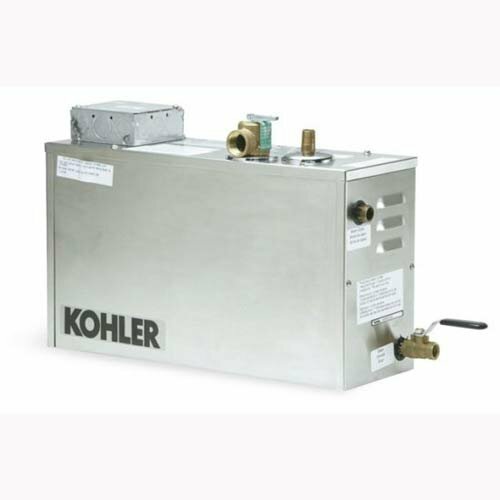 This Kohler Steam Generator produces steam in only one minute of time instead of the typical four minutes. It can clean automatically with only a touch of a button. It can be used in stalls that are between 113-240 cubic feet. All you need is the steam generator control kit or the steam adapter kit which is sold separately. You can take a hot, steamy shower with your normal unit, but doing so will not keep the steam within the bath. You will still get some of the benefits, but by trying to get a steam built up, you have turned up the heat to the point that it will is uncomfortably hot. Another downfall is that in a regular enclosure, valuable steam will be let out of the shower and into the bathroom. Over time, the steam may damage your bathroom’s drywall, paint, and wall papered areas. 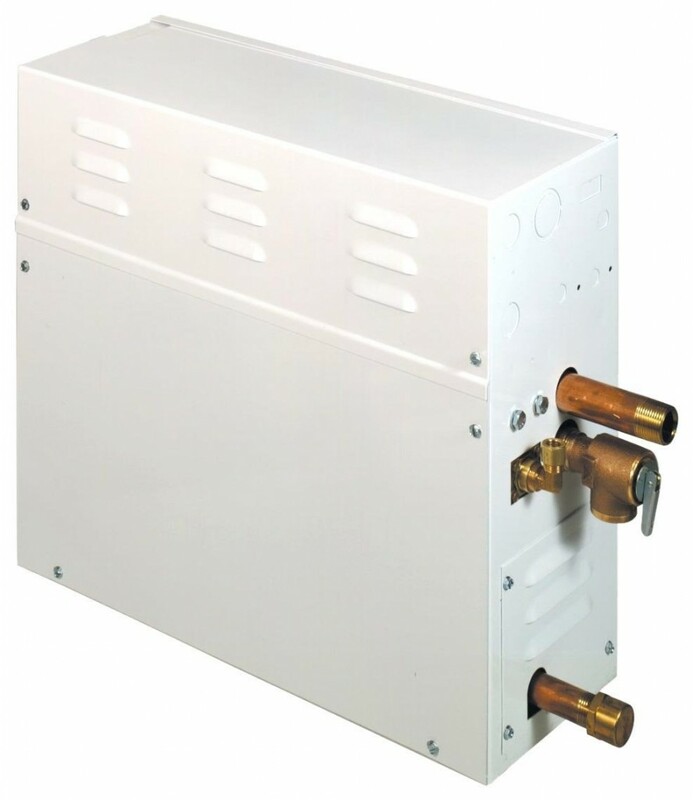 On the other hand, a steam shower unit is a small enclosure that can double as a basic bath. 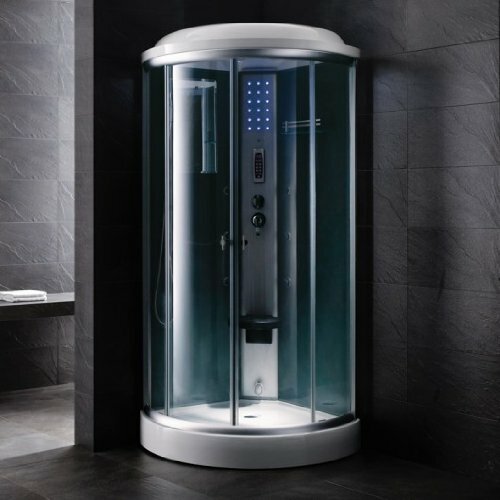 The stall is completely self-contained and features a steam generator that disperses steam around your body. No steam is allowed to leave the stall, so you will never have to worry about the damage it may cause to the rest of your bathroom or home. They can be made using a variety of material, they are available in different sizes, and there are accessories that you can purchase to make them more enjoyable. The reason people visit a sauna is to lose weight and detoxify their body by sweating it out. Now, thanks to steam units, you have the option to do it at home. However, it may surprise some people to know that there are a lot of reasons for it that go much deeper than weight loss. They can give you clearer skin because the steam unclogs pores and then enables you to get dirt and sweat that may be trapped inside of them. It does it naturally while you simply relax and allow the stresses of the day to leave your body. If you want to understand the health benefits, you must look a little deeper. When using steam, your body will experience an increase in circulation. This will increase the oxygen that is in your cells and improve the way your muscles are able to function. It will even improve the flow of blood to your heart and relieve you of fatigue. More circulation means increased metabolism, less muscle aches, and an increase in lung function so that you will not have as much trouble breathing, even if you have a respiratory infection.